We offer our visitors some world-class rides and attractions, and admission is absolutely free. Devastated by fire on the 28th July 2008, Weston super Mare lost one of its most iconic land marks. Fortunately owner Kerry Michael vowed to continue to rebuild the pier at a cost of £34 million. The new pier opened in 2010 and contains state of the art games and rides. The pier will also feature an 85m viewing platform that will allow for breathtaking views of the surrounding areas in the near future. The new Pavilion is open all year round and opens from 10am daily. Open until 9pm every Friday. Closing time will vary due to Winter period. Last admission is 15 minutes before the Pier closes daily. Times may vary for the events calendar. We are closed Christmas Day. We opened up the Weston-super-Mare.com site for people to leave feedback regarding the fire, below are a small section of the comments we received. I went to the Weston-super-Mare Pier last year in the autumn and to see one of the best pier's in England in flames this morning on the news is just awful. I hope that the pier gets rebuilt to what it was, the pier was the tourist attraction in Weston-super-Mare. This is very sad news, I have spent may a weekend on this pier when I was a child and also with my own daughter. It will be sad not to see of there when we visit in August. Let's hope it can be rebuilt. I had my first kiss on the pier as a lad and eventually married my sweetheart. My wife passed away recently and I am distraught to see this special place to me in ruins. Although I will have the memory forever I do hope they rebuild it. I was there yesterday with my partner. He and I tried to go every year, it was where we first met. We will have very fond memories of the peer. Fingers crossed they will rebuild it. Just read the news, what a terrible waste. We come from Holland and spent our holidays in England in 2006 and visited beautiful Weston-super-Mare and the pier. Sure hope that it will be rebuilt. I spent part of my childhood at Weston during the war, then returned many times to stay with the friends the family made at that time, the pier was always there, walking along, looking at the water underneath, taking the children of our friends along it. We received the news in Australia this evening, I rang a friend who I grew up in the area and we shared some memories. The Grand Pier was an annual treat for me and my family, as we took our 2-week holiday in Weston. We always went to the summer show (I remember Bobby Crush and the Black and White Minstrels but forget who else we saw). We used to take the train ride down the pier at least once on the holiday, and I remember my favourite video game in the arcade - it was two badly drawn cowboys shooting each other and it was very popular. I hope the Grand Pier can be revived to its former glory. What a terribly sad sight. I've been to the Pier a couple of times over the past few years and had nothing but fun. I do hope it can be rebuilt. We have all been very upset to see the pier on fire today. We have enjoyed lots of fun times on the pier and have wonderful memories. We hope it will be rebuilt. 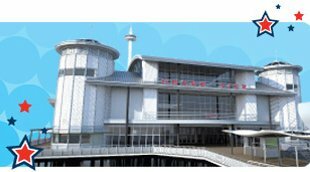 I will be going on holiday this Saturday, to the Unity Resort further along the coast, and the one thing I was looking forward to doing most during my time there was visiting the Grand Pier at Weston Super Mare. Although I have never been before I am really upset this has happened, not just for myself but also for everyone connected with it and for the people who live in Weston. It's a real shame, I hope with all my heart it can be rebuilt and that I can get to see it one day in the future. What a tragedy, my thoughts and prayers are with the people of Weston Super Mare & everyone who hold such dear memories of the pier, i hope in time it will be re-built. I lived thirty miles from Weston, and visited the pier on numerous occasions from the early fifties until i moved to Scotland in nineteen eighty. I remember the "golden arrow" hauling its exited passengers the length of the pier as a child. This is a very sad day. It is so sad news. It is the death of an iconic thing to Weston. Now, it is just a memory. I've only been on it about once and still feel quite sad about the destruction of the pier. I hope they rebuild it again! It is very sad for us to see what has happened to the Grand pier today we have been coming to Weston for many years. I hope it will be able to be rebuilt and we shall continue coming as it is a lovely place, my heart goes out to all the people of Weston and surrounding areas I am sure they must be devastated. I only went with my school on the last week of school and I loved it it is so sad! My two children have had a day out planned with nanny & granddad to visit weston-super-mare today, they saw on sky news this morning what has happened, they were both very upset! It is very sad as six generations of my family have at some point walked along the planks of the pier. On the other hand the new owners were driving people away by not allowing visitors to eat their own food whilst relaxing and taking in the scenery, perhaps now this has happened they may rethink things, once they have a chance to evaluate the situation and seen how much the pier means to people. Yes, it is a business but it is also the making of memories for most people. As a child, I myself would eat my lunch on the pier, when visiting for the day with my Sunday School and on the many day trips with my parents. Young families cannot always afford a day out if they have to buy food, as well as having to pay for their children to have rides and play the machines etc on the pier. So to be able to enjoy sitting outside with their own food is part of their day. This is awful, I spent many summers on the pier as a child and went back for my first wedding anniversary last year. I really hope they can rebuild this wonderful pier. oh my god im very shocked, and very devastated. I am only 15, but I have spent many happy memories there, and it will be greatly missed!! I hope it will be rebuilt, as it will never be the same! I loved it! I am just so sad now. My deepest sympathies to all the people of western super mare who have enjoyed this wonderful pier for so many years. I enjoyed a holiday their every year since 1972. i proposed to my wife their 10 years ago. we were there yesterday celebrating our wedding anniversary. we have many pictures of what was a fantastic building which I feel deserves to be rebuilt after all the enjoyment people have had out of it. RIP THE GRAND PIER AS WE ALL NEW AND LOVED IT. A very sad day for Weston super mare, I have lots of memories of the pier as a child and also late years with hubby and family, so sad to see on TV nearly reduced me to tears to see such a historic landmark being reduced to ruin. Hope they can rebuild better than ever . I am so shocked about the news, My family and I were stood on the end of the pier only on Saturday eating ice cream it is a family day out for us and the pier will be missed. I was born in Weston-super-mare and my family still live in Locking, we have spent many a good time on the pier and I will never forget the time my dad played crack a crab and broke his watch. Also it is a great place just to sit and have a coffee and look out on the town. I think it is a massive loss for the town and it should definitely be replaced. I saw these awful pictures this morning and felt very sad. All of my family have lovely memories of the pier and the rest of Weston Super Mare. I now live in Spain but we used to travel from Worcester regular. I do hope they can re-build it so that our memories can continue. I feel sorry for the residents of Weston as this is huge part of many people's lives. Remember though, they wouldn't add Super to just any old name. my husband and i have visited western super mare and we really enjoyed the experience, we especially liked the pier it illuminated beautifully at night. What an awful shame that it has been destroyed. Hopefully it will be restored to its former glory. What a sight to see today!! I only heard about the fire a few hours ago. I remember going to Weston with my Parents when I was a kid and always made a point to visit the Great Weston "Grand Pier". I always thought the Donuts and Ice Cream were the best in the area plus not to forget the arcade games! I hope they do decide to rebuild! I used to go to Weston- Super - Mare as a child with my grandmother by train from Bath. We spent the day on the pier, playing the slot machines. I loved the pier. It is so sad to see it go up in flames. Weston-super-Mare and it`s Pier holds so many childhood memories for me , over the last 30 years . It is hard to believe it`s gone . Let us hope the pier can be rebuilt. Weston without the pier would sadly no longer be "Super"
I was born and raised in Weston and this is the biggest tragedy to hit the town ever. so many great memories at this pier it is a depressing and devastating loss i could have cried!! I was shocked when I saw the news this morning saying that the pier at Weston had burnt down my husband and I were only sat on the pier on Saturday saying what a wonderful place it was. I am sure it will be rebuilt in the very near future. I'm from Bath originally, and all our Sunday school trips were to dear old Weston Super Mare. I now live in North Wales and have grown up children with families. Every year without fail each one of us visit this wonderful place, my family love it as much as I do. My heart aches for the loss of a bit of history, but knowing how much people love this beautiful pier, it will soon rise from the ashes. Chins up Weston, here is to the future of your lovely town. Memories are precious, and Weston feature in so many of mine, Good Luck. I would like to visit Bristol and Weston super Mare, as a French tourist, flights from Pau to Bristol are direct. This is horrible; I couldn't suffer that if our castle of Pau should burn, I can understand bristolians. Like Fenice in Italy and Parliament of Brittany in France, I hope it shall be completely rebuilt. If I come to Bristol this year, it'll be an act of solidarity, not only for tourism. Oh My God Can somebody tell me what exactly happened. Why? Who's fault is it? I just can't believe that. Such a sad day! Went to Weston-super-Mare for the first time only a few weeks ago - had such a wonderful day! The pier was amazing! Really hope it rises from the ashes! So sad.. Our family have been visiting Weston super mare for over 80 years...we had caravans there throughout the years..! i am visiting in august and it just is not going to be the same!! I could not believe it when I heard about the fire on the news, I was devastated. Whenever i went to western it was because I enjoyed going on the pier. I really hope they can rebuild it. I lived in Locking just outside of Weston-super-Mare until I was 10 yrs old and we moved to Canada. I have some great memories of the beach there as well as going on the rides on the pier. I haven't been back since 1984, but I was very sad to see the fire on my local news in Canada. I go over there every Summer with my youngest Son & we have great fun. It's a great place to visit. So sad to see it go up in flames. I do hope that they are able to re-build it. I cannot believe it! The family had a caravan in Kewstoke on and off over the years. So many memories...particularly watching the fireworks off Knightstone Island in the summer holidays! My boyfriend and I went last year and spent a lot of money on that pier...mainly on the grabbers...and consequently came home with 20 cuddly toys from over 7 days! It was a very sad day when I saw this on the news. IT WILL BE BACK , SURELY THE GOVERNEMENT CAN GET SOME FUNDS TO REBUILD IT ! This Is Shocking. I Loved Going To The Pier With Family. Spending My Mums Money in The Arcades. Enjoying The Train Rides. I am 14 And Loved Going There. Was Meant To Go There In The Holidays. Have a Family Day Out. Weston is Not Going To Be The Same Without The Good Old Pier. I Hope They Rebuild It. I been in Weston Super Mare one year ago. I can't believe what I saw this morning. Who did that? IT's A SHAME !! , I was coming down to Weston super mare on Friday for a holiday and me and my family were going to go to the pier because it was so nice , my mom & dad & Nan would go off and have a cup of tea whilst my sister and I went off to play on the arcade machines. I am totally gutted that the pier has gone but I am sure that somebody will come up with an idea of building a new one . I was on the pier last night . I had such a great time! it's a shame that it's gone but hopefully a new one will be built . I have many fond memories of the pier at Weston, holidays as a child, the first family holiday that my husband & I shared with our eldest child and our two younger children have all enjoyed the pier enormously. The news of today is very upsetting. I truly hope that this can be rebuilt & is not left like Brighton pier or more locally, another Birnbeck. I was devastated when I heard the news from the television, I have many memories of when we used to travel down on the train as a family when I was younger and make a whole day of wasting money on the joyful slot machines! It really is a complete shock, in which many people will defiantly be saddened about throughout the United Kingdom. I have brought the family here numerous times and our visit would not have been complete without time on the pier. This is indeed a very sad day for WSM. Let us hope it gets rebuilt and is not just another Victorian landmark to disappear. Please make it bigger and better. Weston has always been there for me as a child ...my children , my wife & myself . I would like to see the Lottery fund inject some money into rebuilding the Grand Pier as its part of our heritage. Weston offers so much & will continue to go forward whatever happens! I used to live in Weston and worked on the pier in 2004 and 2005. I have many fond memories and I am gutted that it has been destroyed. I still don't think it has properly sunk in even though I have seen the remains of the fire. Everyone I know is really sad about the fire. Shocking! Absolutely shocked when I first heard about the pier. Ever since I was a little kid I have visited the Pier as it has always been the main attraction in Weston. Hard to believe its gone, at the worst possible time of year, the start of the main holiday season and looks like I won't be enjoying the thrill of the pier this year. A very beautiful place to go to in Weston super mare, very relaxing it is such a shame Weston in the 60s-70s-80s had so much to offer now theres very little. I have been coming to Weston since i was a child in the late 70s and there was so many things to do here so much to see. I have lived here for 8 years now and this town has really gone down once a really stunning place to relax and enjoy ones self has turned into some kind of place full of drug addicts-drunks and down and outs why? Please get weston super mare back on its feet I love this town. This is very sad news indeed. I'm a photographer from Swindon. I managed to get this shot of the pier about 2 weeks ago. Living in Australia now, I was so sad to see the pier on fire on our evening news. I grew up in Weston and have many childhood memories of the pier. Hope it is rebuilt so I can show my kids the rebuilt Grand Pier one day. I was so shocked when I turned on the telly yesterday morning and saw the live pictures, I couldn't believe it. A really sad day for Weston and for everyone that has spent many happy times on the pier, I always loved going on the pier and the rest of my family are devastated by this. Hopefully it can be rebuilt, because the town just wouldn't be the same without it. I was so sad yesterday as I am now. I remember my mum taking me there on day trips as a child, and going on the donkey rides. There was a donkey called red rum and I always had to have a ride on him. Later on in life, my boyfriend and I had to be towed off the beach because our car-black RS turbo...showing my age now..lol, had broken down and we cruised down the main road, windows open, music on whilst being towed! Happy times! I hope that the phoenix will rise from the ashes and be the grand building that we all knew and loved. I hope that the youth of Weston will show the rest of their generation that they can make a difference and participate in helping to restore the grand pier. Best wishes to all living in Weston and I hope you get all the support you can. xxxxxxxxxx. Just heard that the new owners are going to rebuild. Great news let's hope the replacement will be up and running as soon as possible. glad the new owners are going to rebuild they must be distraught by this after all the money they have spent lets all come together and thank them for this as it is for all us people from far and wide they are doing it for THANK YOU!!!!!!!!!!!!!! I've spent may a happy hour on the pier as my parents took us to Weston-super-mud as we called it a few times a year. Happy memories. I'm so upset for the people of Weston as well as all of the families which visit every year. The pier was a central part for entertainment and my children are saddened that they will not be able to go to the pier when we come down on our annual holiday in august, although we will still come to Weston for a day out it will be a much different day to the one we had planned. The last time we all came to the pier was august 2006 with my late mother, she enjoyed her day at the pier, especially the sea gulls stealing the chips whilst we sat at the cafe outside and ate our lunch. Find some inspiration to re-build the pier bigger and better than ever, we will be waiting to return again and enjoy some happy family moments. The Ruck family in Hereford. Incredibly sad. Part of my childhood history - so many happy memories of Weston in general and the pier was a large part of that. I hope it gets rebuilt. Our friends who live in Weston rang me up to tell us the really upsetting news early on the morning, Both my husband and myself watched it on the news, I was really upset to watch a wonderful work of art go up in smoke. We have been coming to Weston every year since 1980 when our lad was only a few months old. We was there 2 weeks ago for a week. As he got older all he wanted to do was spend all his time on the Pier, Spending all his pocket money on the amusements. Weston is our favourite holiday resort, The pier is the heart and main attraction of Weston. Especially since they decided to close the Tropicana open air baths. I do hope it can be re-built. Such a sad event! I was in Brighton last year and looked at the remains of its West Pier, which touched me deeply. Now to lose another one is dreadful! British, be proud of your heritage, so don't hope to re-built this pier; simply rebuilt it! I spent many happy family holidays in Weston and both me and my sister are really sad to see the pier destroyed so quickly. I just hope it can be returned to its former glory so my little boy can also have fond memories of holidays in Weston. I grew up in Weston, and worked in the grand pier fish 'n chip cafe in July/ August 1969 & 1970 whilst a Uni student. So many fond memories. seeing the news on the net last night (in adelaide), I felt a great sense of sadness... it felt as though the tower of Pisa had fallen over... but worse 35 years in Australia hasn't take the love of Weston out of me and as Joni Mitchell sang: you don't know what you've got till it's gone... fingers crossed and by whatever which means... let's resurrect it! Weston needs a grand pier! I've got so many fond memories with my parents, Gran and Granddad, I remember the old model train room, the Rozel, the old open air swimming pool, the putting green (by the crazy golf),putting in the winter gardens, Knightstone theatre, even the old pier with the ferry. One by one, they have all gone, I relly hope it the Grand Pier is restored to its former glory, i love Weston, looking at it at night lit up was great. Without at least this one focal point Weston will degenerate. An absolutely devastating site to see such a wonderful building burning to the ground and huge sympathy to the Micheal's Family, wishing them all the best in the future for rebuilding and more wonderful years of such fun on the pier. My 20 year-old South African nephew first savoured the delights of an English pier at Weston. He LOVED it & remembers it very fondly. I love looking back at the town and the surrounding coast from the end of the pier - hope it will open again before too long. Oh My God - I am so gutted. I am going there tonight on holidays and I really wanted to go there! Oh God. So many Brummies are devastated by what has happened to that beautiful old building. I visit at least 4 times a year & the pier is always the first place I go to. Everyone I speak to wants to help. PLEASE start a fund - QUICKLY- so that we can help re build this Great British icon. Or even to aid the poor employees who must be in dire straits. I live in w-s-m & don't get me wrong, but maybe this could be a blessing in disguise? Maybe this will make the council realize that it has to spend it is money not on just one attraction but make it an all-round leisure town (such as the renovation of the Tropicana?) Best wishes to the owners though. We have been going to Weston as a family for the last 13 years and are due to go on Saturday for our annual 2 week trip to Weston. Our boys are devastated, our holiday just won't be the same. We hope they re-build the pier, it is an icon. I have visited Weston regularly for as long as I can remember. No trip to Weston is/was complete without a walk along the pier. In fact, in my role as cameraman I filmed on the pier last year and will treasure the footage for years to come. It would be nice to think that if the pavilion is rebuilt it will be in the same style so that memories will continue to be rekindled) no pun intended. I live in Galway in Ireland but my mum is originally from Bristol. As some of our extended family still live there, We would visit regularly. The highlight of our trip is a day out at Weston super mare. I can still remember the adrenaline rush as we reached the end of the pier to get to the amusements. We are devastated over the fire but wish them the best of luck for the re-build. I was so shocked when driving to work and i could see the cloud of smoke from Avon mouth and then the news came on about the pier. I have very happy memories from the pier from when I was a kid up to present day...will be sadly missed to me and Weston. Me and my mates where only go down this sat to try out the new go-karts. Hope it can be re-build. My Mum was born in London. Our family visited England several times thru the years. One of her brothers (my uncle) who lived in Kingswood Bristol introduced me to the donkey/mule rides along the beach at Western Super Mare years ago. The pier was fantastic with the trolley ride from one end to the other. The sites, the sounds, and smells from that pier & beach were ALWAYS so unbelievablygreat. Each visit - so many good memories of such fun times. Perhaps all the 'good old memories' will be brought back to this town within a short time when this pier gets rebuilt. Times are tough but maybe some of the wealthier people who have extra will donate to restoring memories for all to enjoy. Those who do not have money will perhaps donate in a different way. The people of this town have always been generous to all of us who are outsiders. Please - lets be generous to them. We do not want this town to be lost because they have lost this great pier. We need to support the town and its people in restoring memories, great times and their great pier. Still deeply saddened by yesterdays sights, My Great Granddad lived in Weston for many years, It is a place that is so close to my heart. Only hope it will be rebuilt. Come on British government help our country!! I was going to go there the day before it happened but could not make it and was planning to go there today. I love the pier and my parents are always saying how i would run up the walk way to the pier as I could not wait to get there and have fun. It's such a shame and hopefully they can build it up again. I was born and lived in Weston till my family emigrated to Australia, I was lucky enough to return last Sept and show my wife where I was born and lived. We visited the Pier with pride and enjoyed Westons major attraction. It made all the major news networks here in Aussie, but the news was a great shock to us both and all my family which has fond memories of the pier, and Weston. I am grad we saw it in its glory and hope the pier can be rebuilt, it is a Weston ICON. When I was a "jeune fille au pair" in Bleadon, I came each time when I was free... and I spend a lot of money to have fun at the Pier... It was great memories... and I am honest, I am a little bit sad... what will I show to my children? A really sad event for Weston, but the Michael family have promised a rebuild, and I am sure they will. Can I suggest the facade is rebuilt to the 1904 plans and maybe the new pier will include the "phoenix bar". Good luck Mr Michael, Weston is behind you! Such a sad fate for a place that brought great pleasure and happy memories for many. 1960' & 70's - The Golden Arrow train, warped wooden planks, dry timber smell, excitement as you near the far end building, carousel horses, dodgems, slots, ghost train, pin-ball machines depositing tubes of polos, coins rattling, machines ringing, clanking, push penny machines, candy floss, ice cream...wonderful memories / Happy Holidays... We have to re-build. Very, very sad day for all locals, met my wife on the pier, and Weston will never be the same again, lets all hope its rebuilt asap. What a shame, we are so sorry to hear about the pier in Weston. We visit the pier every year, walk down to the arcade and fair, playing on the machines then buy an ice cream to eat on the short train ride back!!! It was the main attraction in Weston. I had the best day of my life on the pier. My husband took me there the day I had my first scan when I was pregnant with my daughter. It was special because it was just after my mum died. The sun was shining and we ate ice cream on the pier, it made me feel that there was hope in the world. My children are now 18 and 21 and are saddened by the fire as this was part of their growing up years. Putting pennies in machines and keep winning and not getting rid of them. Also getting lots of tokens out of machines but only being able to get a keyring. It was also their first time on a ghost train. So a lot of memories went with the Pier. I was very sad to see The Pier burn down. I am 21 and I have come to Weston from South Wales nearly every year since I was a child and loved my time there. This won't stop me coming to Weston but I hope the Pier can be rebuilt for the future generation to enjoy as well. I like it at Weston super mare on the pier it was good i miss it now and we was going to there but we cannot now. Another piece of the classic British holiday gone. Let's hope and pray that the fantastic building will be rebuilt as it was, but the reality is that this is unlikely with the costs involved. Far too many of our piers have gone or are on the verge of being lost. look at the west pier in Brighton, left to decay for so long- now gone and Hasting pier hanging on, but for how long! We visited Weston-super-mare last year in September, it was Emma's first visit to an English Seaside town and she loved the Pier and the wonderful arcade at the end. Neil spent a lot of his childhood weekend trips with his family here and has many fond memories that will be treasured. We are devastated to hear that fire has destroyed the pier and hope it can be rebuilt so we can bring our own children back in years to come! This is an awful event. I spent many a holiday during my childhood in the 70's with my mother and father visiting Weston and these memories are as clear as anything to me. From playing the penny bandits to riding the helter-skelter and attempting to control the go carts on the slippery wooden track I shall always have fond memories of this great attraction. I hope they do rebuild it sooner than later so that I can take my daughter to enjoy the experience. I've never seen your pier, but believe it is important to maintain our heritage and would hope that your town finds the resources to rebuild. I would like to pledge to see that happen. Its such a shame my Nan was there with some family she was going to walk on it that day. 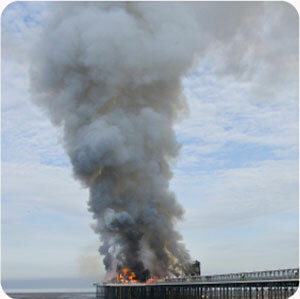 The fire of the Weston super mare pier was a great shame because it had been there for many of hundreds of years. I heard it was caused by a chip fire! I used to have great fun on the pier that was the tradition of Weston Super Mare. If you have any more information about this please email me on www.misscieraregan@msn.com because a seaside isn't a sea side if it don't have a pier !! thank you. Myself and Hannah, will greatly miss Weston pier, Hannah loves the candy floss and I loved the freshly cooked doughnuts!!! It is a shame to see it go, it will be greatly missed by all, WE WILL MISS THE BUMPER CARS!!!! Wow this is unbelievable. It was my first time travelling to England this year and Weston super mare was one of my favourite places to visit. What a tragedy. I arrived as a 17yr old at RAF Locking in 1970 and visited the pier regulary for three and a half years. I have many fond memories of the pier and Weston and it is my desire to visit Weston sometime in the future. For a period of time after moving off camp I lived at Sunnyside Road. To me and many others the pier was Weston, everyone visited the pier and I would only pray that it is re-built to its former glory. I would love to get photographs of Weston from the 70's and would appreciate any reader e mailing me some to 'aljen11@hotmail.com'. My thoughts are with the people of Weston. Visited Weston in 2001 and the Pier is the landmark that comes to mind when I think of that trip. What a loss, we passed good times there. How sad. We love going to Weston super mare and will keep going, it's so sad about the pier, we spent many hours sitting on there and looking out to sea, and in time like the 'phoenix' it can arise from the ashes and be just as spectacular as it once was. Yes the fire has destroyed the pier, but it can never destroy our memories and looking at all the messages on this site everyone feels the same.. Thank Weston super mare all 1000 of us from Coventry had a great time!!!!! I have been going to Weston since I was a baby in 1953. I have so many memories from then and I have been taking my son there and he's 30 this year. I am sure it will be rebuilt to give other families to enjoy for the next 100yrs. I am going to Weston on a coach trip tomorrow and don't quite know how I will feel seeing it now as I shed a few tears when it was on the news and the above video. I grew up going to that pier. 'Ive had so many memories there. Seeing it go up like that is terrible. Me and my fiancé would go down there just to get away. It will be missed greatly. Hey, i'm just over 18 years old & remember going to the pier after school with my family. We lived about an hour away, but I loved the journey because I would be able to play on the pier. I was devastated like many to find it a smouldering wreck on the front pages of many newspapers whilst Iwas on holiday. My deepest sympathies go out to all who enjoyed the wonderful memories the pier brought to us. I'm living in Weston at the moment and when I came home earlier this week from Bournemouth, I see the aftermath of the pier. It's such a shame for a building like the pier to go down. There's now nothing left for us to do really. Tropicana gone down and now the pier. It's such a shame that we've lost the true icon of Weston. I suggest we have something like a Pier aid concert to help the rebuilding of the pier, there's already a Facebook group setup by some people about it. It needs to be restored, Weston is nothing without the pier. I have been to Weston-super-mare quite a few times and one of our favourite things to do is to visit the pier and spend money on the machines this is dreadful news and hopefully someone will find the money to build another which will never be able to compete against the old one but will make people revisit. There will be some lost memories. I have many happy childhood memories of Weston, the donkeys, the mud and the pier! It was a shock to see the news and know that it will never be the same. I wonder how many of the older machines were still there, I remember the ones that used to take a penny and showed little animated scenes - for some reason the one that sticks in my mind was some poor guy in an electric chair getting zapped. One of my favourite movies is The Remains of The Day, and I always sigh when they get to the scene that was shot on the pier. A very sad day indeed. My family and I have spent many a great day on the pier. Growing up in the area meant we could visit as many times a year as we wished. I was so upset by the news and hope it can be rebuilt very soon. My mother was from Weston and met my father when he was stationed there during World War II. My dad was an American G.I. and they met outside the Grand Atlantic Hotel just across from the Grand Pier. Mum never tired of telling us stories of the way they "courted" and how much of that courtship involved walks on the Grand Pier. Dad went to France and then back to the U.S. They corresponded for several years and finally Mum agreed to marry him. She moved to Toledo, Ohio and they were married for fifty-two years. Dad died in 2002 and Mum died (age 82) this past February 20th. They went back as often as they could. I spent several summers in Weston between the ages of four and nine and all of my memories involve the Pier. It was the first place I played a "slot machine" and rode a roller coaster. Every time I think of the Pier I think of fish-and-chips and the "clang clang" sounds of the pier train. When I was nine I was allowed to wander Weston by myself and I always spent part of my afternoon at the Pier. After Dad died I took Mum back to Weston three times. She always wanted to visit the Pier and I was always glad that, essentially, it had not changed since my childhood. (I am 56 now.) On two vacations we were accompanied by a couple who are close friends of mine and who have travelled extensively. They both said that Weston was one the finest places they had ever visited and how memorable the sea-front was, particularly the Pier. Since Mum died my sister and I have been going through all of her memorabilia from Weston. Every tour book, card and guide features a picture of the Grand Pier on the cover. The Grand Pier is indelibly part of my happiest childhood memories. I am glad that Mum passed away before the Pier burned because she would have been so saddened to have lost this important piece of her life. All of my my remaining friends and relatives in Weston Have told me how devastated they are by the loss. My sister and I hope to take our parent's ashes back to Weston next year and scatter them as close as possible to where they met. I hope that efforts have been commenced by that time to rebuild the Grand Pier. For me, in truth, Weston is more than the Grand Pier. It is the sea-front, Grove Park, Clarence Park, Uphill, Worle, the toll-road to Kewstoke, the pubs and the people. However the Pier is a vital part of all of it that sort of holds it all together. I always loved having a pint at the Winter Gardens or one of the sea-front hotels just as the Pier's night lights came on during a summer evening. Even the most jaded young vacationer gasped a little "Ooohh" when that happened. I hope that many people have similar memories and will contribute to the rebuilding of the Grand Pier. If (When!) it is rebuilt I hope that the architects and designers will keep as much of the old design and look as possible. I know that it will have to be "modern" but it would be nice if it could inspire some of the same memories for children today as it did for me. (Sorry to have gone on so long.) Yours: John H. Shuba 2727 - 110th Street Toledo, Ohio 43611 U.S.A.
We lived in the basement flat of the Berkeley House directly across from the Grand Pier 1944-1953. My brother and I played on the beach and the pier countless times, how sad to see it destroyed! My wife and I visited England 5 years ago and, of course, went to Weston and the Grand Pier. So many memories! We're so glad we made the trip! The Berkeley is still there, but our flat is now a souvenir shop. I was very saddened to hear the news of the pier fire. We spent many holidays/days out there as a youngster and now, with my 4 year old daughter too. My husband also proposed to me at the end of the pier when he won a rainbow plastic heart shaped ring (which I still have) - so very sad news but lots of lovely memories. I feel I have lost a friend. I met my first boyfriend there. Then later with future husband, while saving to marry, it was a cheap afternoon out. Meeting and greeting whilst walking the boards. When I moved away I made sure my children enjoyed days there on trips 'home' and they became infected with my love of the thrill of the fair coupled with a bygone grace. I was due to introduce my grandson to the G.P. this year. Please re-build it, BUT NOT in some ghastly modern style. Give the Grand Old Lady of WSM her dues and retain the original splendour and elegance. I loved the pier at Weston the coin machines the teddy grabbers and for a while a little rollercoaster outside..... The little train whizzing up and down and trying to get a seat along the pier... you had to be prepared to fight for one!! Very sad day to hear about the piers fire but it will be back better than ever!! I go to Weston every year, have so many memories, as a kid and as a mother. I am gutted..